A couple of years ago I sat at a wine bar in SW Illinois. The unique thing about this place was that behind the curved bar, around 50 taps were installed with the sole purpose of spouting out wine. However, in an ironic similarity to ever other bar in America, they weren’t actually serving wine by tap. They had yet to receive a single keg of wine to tap. The concept isn’t new; it’s been bouncing around in the industry for the past 20 years or so, but the implementation is far from being mainstream. The appeal of this system makes sense: There is less packaging waste, wine can be sold in more of a bulk form and thus is more efficient (profitable) to move, and shelf life is extended. Beer has fully embraced the concept for a number of years so I have been wondering for awhile now why wine has been slow to adopt this format. I posed this question to my friend, Jeremy who will be in charge of expanding the Old Chicago restaurant chain into the SE over the next couple of years. “Wine sales are so low compared to our other alcohol sales that there’s little incentive to invest in something like that.” The keyword there being “invest”. In order to have wine by tap in a restaurant, new taps would have to be put in or existing and profitable beer taps would have to be taken over. This is additionally hampered by the low number of wines that are actually sold in a tap-able form. While restaurants like Old Chicago cannot be considered bastions for the wine drinking public, those that primarily serve wine by the glass still face the same Chicken and the Egg situation. The folks at Vinocopia Barrel may have part of the solution. Their flagship product is a fully contained, wine dispensing system that delivers wine through a spout in their display-worthy barrels. Therefore, after the barrels are bought, all the restaurant or consumer need to provide is space. When I stopped in at their headquarters in Minneapolis to see their product it appeared they were attempting to bypass the lack of wine by tap infrastructure. The barrel itself is more of a housing for the removable container inside which is changed out when empty. However, the only wine you can get in their barrels right now is from Piattelli Vineyards. Not so coincidentally, the vineyard and the barrel system have the same owner. Perhaps their recyclable barrel system is more an attempt at coming up with alternative packaging while avoiding the stigma of boxed wine. Regardless, they do have a slowly growing customer base. 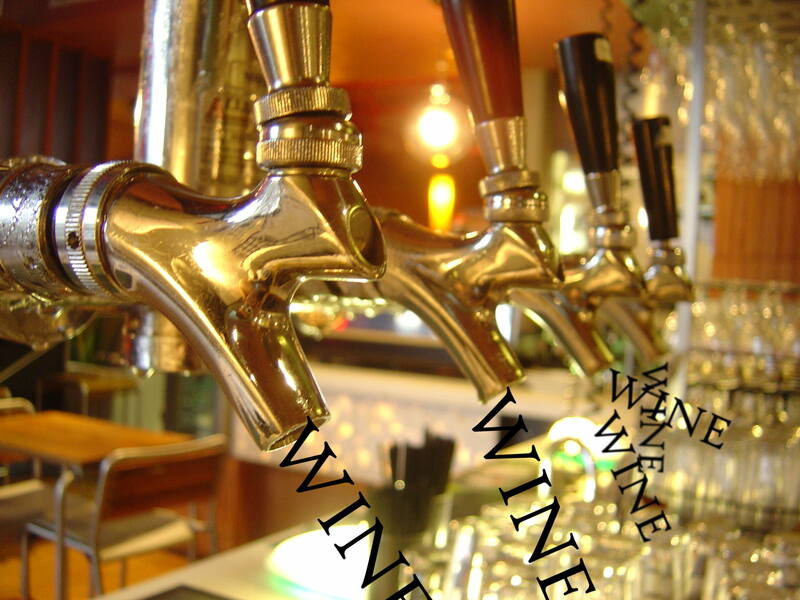 There are those who anticipate restaurants to invest in the wine by tap infrastructure as well. Richer Pour is a company out of Boston that not only packages wine into a format that can be tapped, but also seeks out a variety of wines to put into their containers. However, like Vinocopia their system does not involve the traditional metal keg that we are familiar with. Their containers are disposable once they have run dry. The metal kegs that seem to be a central focus point of any teenage party movie are wonderfully efficient for not only keeping oxygen out of the contained alcohol, but also keeping the carbonation in. Perhaps sparkling wines by tap would make more sense to start off with then? Cocktail houses and their patrons would no doubt appreciate a freshly carbonated pour of sparkling wine that could be reproduced every time. Until then, we will continue drinking to the soft pops of wine corks being expelled in the background.